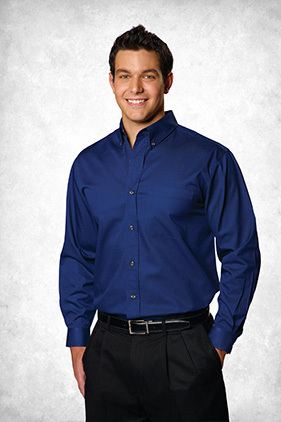 60% cotton/40% polyester 4.5 ounce long sleeve twill shirts treated with Dupont™ Teflon® fabric protector. Stain resistant, liquid repellent, lightweight, breathable fabric. Double needle stitching with 2-ply back yoke. Three button adjustable placket cuff. Button-down collar, Felled seams, Reactive dye. Left chest pocket. Glazed wood style buttons with spare. Heathered colors have dyed-to-match buttons. Ladies style (5283) is tapered with front and back darts and a ladies placket.